An unusual and revealing political fight over health care has been unfolding in Florida. It's unusual because it pits Rick Scott, the Republican governor, against some members of his own party. It's revealing because it lays bare the motives of the Affordable Care Act's most determined detractors. Conservatives have plenty of genuine, intellectually honest reservations about the changes that came with Obamacare. They don't like the new government spending and regulation, for example. In some cases, conservatives object to the whole notion of government-sponsored insurance. But the Florida dispute demonstrates that differences over policy can't, on their own, explain the fervor now on display. The law and its enactment have tapped into something deeper and more primal -- about what the law represents, or, perhaps, the president who signed it. Those feelings are so strong that, in Washington, Republicans have tried dramatic and unprecedented measures, such as shutting down the government. And from the looks of things, the anger is not going away anytime soon, particularly with a Republican presidential campaign underway and a potentially devastating Supreme Court decision looming. At issue in the Florida controversy is how the state provides health care to some of its lowest-income residents. Under the Affordable Care Act, states can modify their Medicaid programs, which have long provided insurance to the poor, so that anybody living in a household with income below or just above the poverty line can qualify for coverage. That's about $32,000 a year for a family of four. With Medicaid coverage, these people can actually pay medical bills, rather than rely on charity from doctors, hospitals, and other providers of care. The Affordable Care Act's architects hoped that all states would expand their Medicaid programs right away, if not to help people get health insurance, then at least to bolster state economies. After all, the federal government finances nearly the entire cost of covering anybody who gets insurance under the broader eligibility guidelines. One reason the Affordable Care Act puts up that cash is the health care law simultaneously reduces what Medicare and Medicaid are paying hospitals, in order to restrain government spending and overall health care costs. Getting previously uninsured people onto Medicaid is supposed to offset the impact of those cuts. It was a major reason that, back in 2009 and 2010, the hospital industry endorsed the legislation that eventually became the Affordable Care Act. More than half of the states have expanded their Medicaid programs, just as the law's advocates anticipated. Florida has been among the holdouts, taking advantage of leeway a 2012 Supreme Court decision gave to states. Scott, whose position on the expansion has varied, depending upon the political conditions of the moment, currently says he wants no part of it. Republican leaders in the state legislature, particularly the House, have been consistently hostile. But Florida's budget situation is about to change, in ways that make opposition more difficult for these officials to justify. Like many states, Florida hospitals have access to some special federal grants designed to offset the losses that they take when they provide discounted or free care to the poor. These grants date back to a Bush-era program, enacted before the Affordable Care Act was around to give those same people insurance. The federal government has discretion over when to make those grants and, last year, the Obama administration made clear it would not be renewing Florida's beyond 2015, now that the Affordable Care Act's Medicaid money is there for the taking. Republican leaders in the state Senate understood the implications. They'd have a big hole in the budget to fill unless they came up with some other way to finance health care for the poor. Among the first things to go would be a tax cut that Republicans cherish. "It really puts everything at risk," Andy Gardiner, leader of the Senate Republicans, told The Washington Post's Greg Sargent, who's been following the story closely. "It jeopardizes the tax cuts, it jeopardizes increases in education funding, it jeopardizes our priorities." Rather than give up on those, Senate Republicans passed a bill to expand Medicaid, albeit with a few conservative modifications. (The merits of those modifications, and what they'd do to Medicaid, are subjects for another day.) It's precisely the strategy that Republican officials in Arkansas and Michigan, among other states, have used. But Florida House Republicans, who met behind closed doors on Tuesday, aren't budging. And neither, it seems, is Scott. Instead, he's decided to sue the federal government -- on the theory that, by refusing to extend the special grant for hospitals, the Obama administration is engaged in unconstitutional coercion of a state. Gardiner has called Scott's decision "difficult to understand." It's even more difficult to understand given the math. A few years ago, the Kaiser Family Foundation published an analysis by researchers at the Urban Institute. It projected the cost of expanding Medicaid in each state and then broke down the implications for state budgets. The numbers for Florida were striking. Over 10 years, the researchers found, making Medicaid available to all low-income people would cost about $71 billion above and beyond what the state's Medicaid program would otherwise cost. That's a lot of money, for sure. But roughly $66 billion of the total, the researchers found, would come from the federal government. That would leave Florida taxpayers on the hook for the remaining $5 billion, with at least some of that money coming back to them in the form of reduced spending on other programs. To put it another way, expanding Medicaid in Florida would likely require a net investment by state taxpayers that, over the course of a decade, would work out to less than a half-billion dollars a year. That's without accounting for any additional growth and tax revenues that the huge infusion of federal dollars might provide. That's also without accounting for the more than $1 billion a year in that, without expanding Medicaid, Florida would probably have to scrounge up in order to help hospitals defray the cost of charity care. 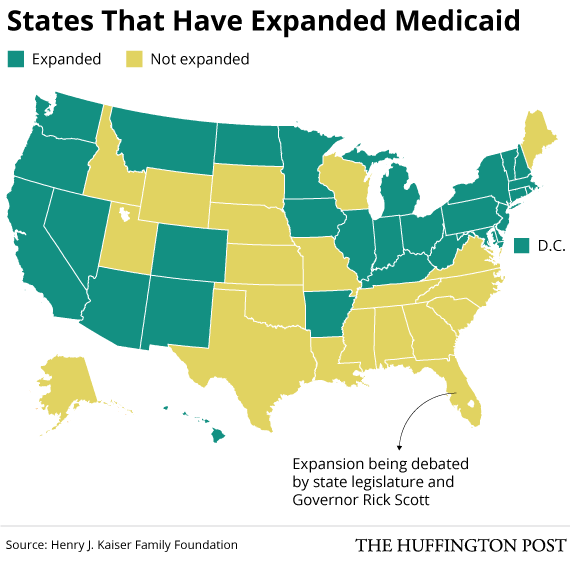 In short, if the numbers were lopsided in favor of expanding Medicaid before, they are even more lopsided now. And it's not as if anybody is arguing seriously that those grants are a superior way of financing care for the poor. If anything, the opposite is true -- and it's one reason the editorial page of the Tampa Bay Times called Scott's position "indefensible." Other editorial pages, civic organizations, and business groups across the state have made similar statements. In response, Scott has said he's just looking out for state finances, because the federal government might someday pull back on its Medicaid commitment and leave state government responsible for financing a much larger Medicaid program. But as another Kaiser report has noted, the federal matching rate for Medicaid has remained remarkably stable over time -- except for rare changes that, on balance, meant the feds were paying more. Of course, conservative fervor to block or repeal the Affordable Care Act has always seemed a bit disconnected from reality, given that the law consists almost entirely of pieces that existed, without such fuss, long before Obamacare came along. The lone exception is the "individual mandate," the requirement that people carry insurance or pay a fee. And that's an idea that plenty of conservatives tolerated -- and some even supported -- less than a decade ago. In fact, it was a conservative expert at the Heritage Foundation who many historians credit with the idea. No, the level of hostility to Obamacare makes very little sense -- unless it's about something beyond the policy particulars. It could be the fact that Democrats finally accomplished something big, for the first time in several decades, thereby expanding the welfare state at a time when conservatives thought they were on their way to shrinking it. Or it could be the idea that, on net, the Affordable Care Act transfers resources away from richer, whiter people to poorer, darker people. Or it could be the fact that "Obamacare" contains the word "Obama," whose legitimacy as president at least some conservatives just can't accept. Who knows? The only thing certain is that, in Florida, turning down Medicaid has even weaker logic than it did before -- except for officials obsessed with Obamacare or determined to please the people who are. Rick Scott may belong in either category and he might just belong in both.